Miss World 2017 is on its road to finale and is scheduled to be held in Sanya, China on Saturday 18th November. Amidst all this excitement and wait, the organization is here with a new format known to be the Head to Head Challenge. Basically, the challenge will take place between October 21st and November 15th at different locations visited by the candidates during the Miss World 2017 Fiesta. 20 groups of 6 Countries will go head to head forto grab a place in the Top 40 Round. The number of countries in every group may be adjusted as per the final number of candidates. The winner of every group will straight away qualify for the Miss World Top 40. If a candidate does not win her Head to Head challenge, she still has an opportunity to be in the Top 40 by winning a fast track or via judges’ selection. 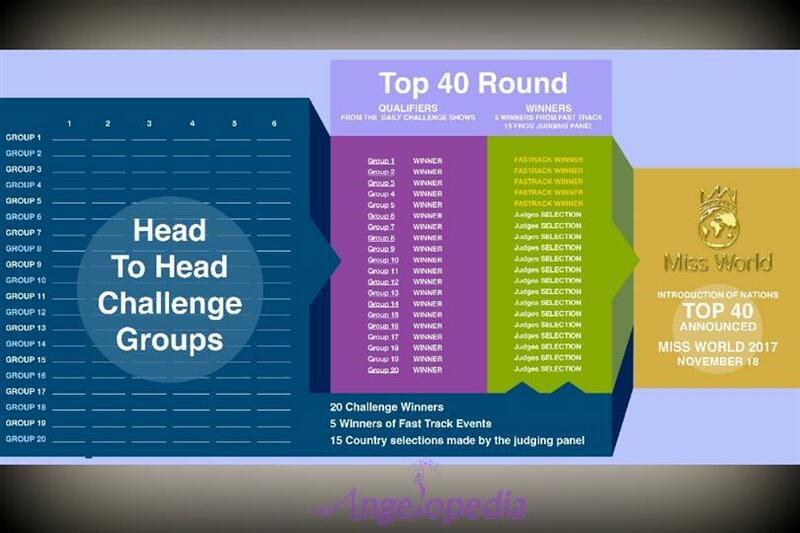 The Top 40 will included, 20 head to head challenge winners, 5 fast track winners i.e. (Beauty With A Purpose, Multimedia, Talent, Sports, and Top Model), and 15 judges selection. The winner of each Challenge Group will automatically advance to the Miss World Top 40 Round. The 6 Countries in each group will make their opening remarks followed by a performance. This can be a blend of live presentation and pre-recorded VT. The maximum total time for each presentation will be 2 minutes. After the performances, the contestants will answer questions from the presenter and online community. This procedure will be part of a GD and will last for around 8 minutes. Lastly, every competitor will answer the question of the day (30 to 45 seconds for each country to answer). How Will This Be Adjudged? The public will be asked to select the winner of each Group through a free vote. The presenter will open the vote to the public after the opening performances. Voting will remain open until the start of the next Challenge event when the champion of the previous Head to Head Challenge will be declared. A live draw will take place to choose which countries go into which groups. When Will Your Representative Be Contending? A schedule of the exact dates and times of each Challenge event will be delivered after the Miss World Group draw takes place. It means that every contestant will have a chance to be in the public eye during the Miss World Festival. The voting will be free through Miss World App or Facebook. With that if a Country cannot download the App or does not have Facebook, a free equivalent will be provided. The excitement has already reached to its pinnacle as the new format looks fun and energizing!